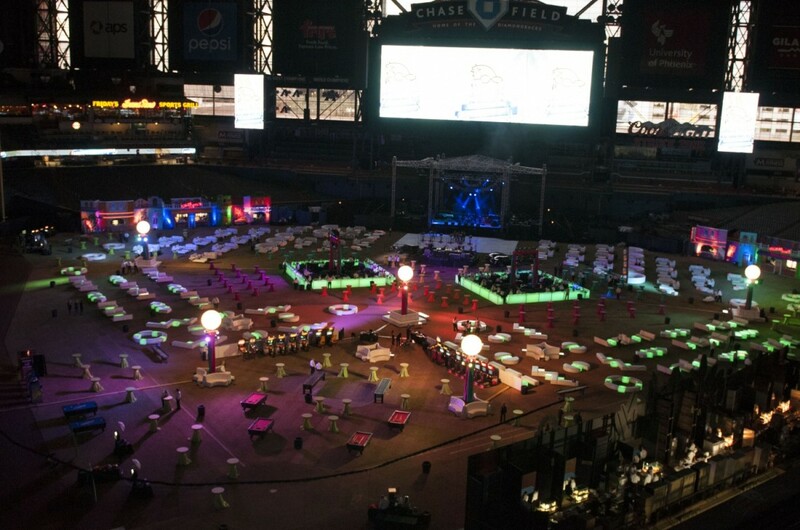 (Dec.13, 2014) – ESA transformed Chase Field into a high-energy Latin-themed party for attendees at this year’s GoDaddy‘s corporate holiday party. This was the 3rd year in a row ESA managed the event for GoDaddy, and this year the number of attendees topped 5300! Guests were greeted with the beat from the Brazilian drum troupe and dancers, and then dazzled by large Latin-themed facades, entertainment, lights and music pulsing on the field. We also had glitter tattoo artists, pool tables, foosball, arcade games, photo stations and green screens. When guests got hungry, they could choose Latin-style cuisine from multiple food stations. Or, if they wanted to take in a Latin-lounge feel, they could mingle at large glow bars or hang out in areas filled with comfy furniture. Keeping with the theme, the night’s music performers included Daddy Yankee, who got the guests pumped up, and then PitBull took the stage and the crowd went crazy! The field was filled with glitz and the vibrant energy of Latin music – it was one big party! ESA managed all décor, set up, on field gaming and interactive entertainment for this huge GoDaddy event.